BAGHDAD, Iraq (CNN) -- A suicide car bomb detonated Friday near an Iraqi police checkpoint on a busy street in central Baghdad, killing at least eight Iraqis and wounding 41 others, according to the Iraqi Health and Interior ministries. Earlier Friday, another car bomb detonated on Haifa Street in Baghdad, killing the two occupants of the vehicle, according to a representative for the U.S. Army's 1st Cavalry Division. 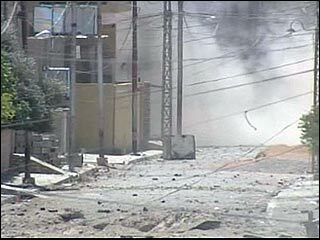 Insurgents continued to battle Iraqi forces backed by U.S. troops on Haifa Street on Thursday. Three Iraqi national guardsmen were wounded in the fighting and taken to a nearby hospital, according to hospital officials. Iraqi police have blocked off roads in the area. Earlier this week, a U.S. helicopter gunship attack killed several people surrounding the wreckage of a U.S. armored vehicle in the same area. Witnesses said U.S. forces struck without provocation, but U.S. military officials said troops came under intense gunfire from the area as they tried to recover the damaged vehicle. On Tuesday, a car bomb attack on a police station near Haifa Street killed 47 people -- many of them police recruits who had lined up outside the building to apply for jobs. Multinational forces carried out an airstrike Friday night that targeted a building in central Falluja where they said followers of suspected terror mastermind Abu Musab al-Zarqawi had gathered. About 10 al-Zarqawi supporters were meeting at the site, the military said. The "precision strike" occurred about 9:30 p.m. (1:30 p.m. ET) The gathering was near the Mujahireen Mosque and a school. There was no indication that civilians were in the vicinity of the strike, the military said. The U.S. Marines announced "Operation Hurricane," described as "clearing operations" in Ramadi, west of Baghdad, intended to discover and remove illegal weapons and ammunition caches. The 1st Marine Division said U.S.-led multinational forces were attempting to disrupt the Dahman terrorist network, which is linked to al-Zarqawi. The Marines said the Dahman network has been responsible for attacks on military and civilian targets in the western province of Anbar. Marine Cpl. Wassef Ali Hassoun is being questioned by investigators from the Naval Criminal Investigative Service about his disappearance in Iraq on June 19. A 4th Marine Expeditionary Brigade spokesman said Friday the case "is not being treated as a criminal investigation." Hassoun, who has been returned to full duty, had been listed as a deserter. His status was changed to captured after the release June 27 of a videotape that showed him blindfolded with a sword being held over his head.